First Line: The cold wind made the girl shiver. If you pay a call on Cal McGill, you'll find a sign stating "Flotsam and Jetsam Investigations." Cal is an Edinburgh-based oceanographer, environmentalist, and one-of-a-kind investigator. Using his knowledge of ocean currents, prevailing winds, and shipping records, McGill can track where objects have come from-- or where they've gone. He's beginning to make a bit of a name for himself in this unlikely occupation. He's going to need all his skill to solve a mystery that has police stumped. Severed feet have begun washing up on islands off the coast of Scotland. Two of the feet belong to the same person, yet they turned up on beaches many, many miles apart. Little does McGill realize that when he starts to investigate this particular case, he'll unravel a powder keg of corruption, exploitation, and violence. As a result, many lives will be threatened across the globe-- including his own. 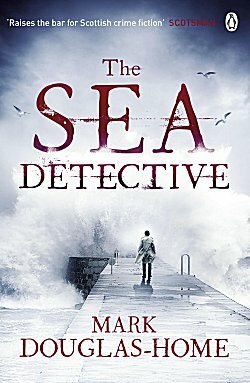 Within the space of a week, two of my most trusted sources for book recommendations raved about Mark Douglas-Home's The Sea Detective. When I looked it up online and read the synopsis, I immediately ordered a copy. (Actually I ordered it and the second book in the series because I trusted those recommendations so much.) My friends did not steer me wrong. Now I'm joining my voice with theirs to say that if you enjoy well-written crime fiction with an unusual focus and quirky characters, you need to get your hands on this book, too. The setting of the Scottish Highlands is mere icing on the cake. Cal McGill is a prickly sort of character who seems much more at home with his oceanography studies than he does with people. As an environmentalist, he's been known to put his reputation on the line to prove a point. Helen Jamieson is a rising star in the local police force. She's overweight and plain-- a fact that her obnoxious superior Detective Inspector David Ryan never misses a chance to point out. But when it comes to investigating crimes, her force of will and creative thinking know no bounds. The Edinburgh police believe Cal McGill is nothing but a nutcase and a scofflaw. Only Helen can see how perfectly suited he is to find out what's going on with these severed feet. If severed feet wearing shoes washing ashore in various locations sounds vaguely familiar, it should. Douglas-Home's plot is based on fact, and his conclusions are not only plausible, they're downright chilling. As a bonus, we're also brought along on an investigation that McGill has carried close to his heart since he was a small boy: the loss at sea of his grandfather during World War II. Both mysteries are absolutely compelling, with the "cold case" highlighting to perfection how insular tiny villages in the remote areas of Scotland can be. Two engrossing mysteries, a unique way of solving them, a pitch perfect setting, and vividly drawn characters all combined to create a story that I didn't want to see end. Fortunately, I have the next book in the series, The Woman Who Walked into the Sea, to prevent any symptoms of withdrawal. Glad you liked this one as much as me, Cathy, and The Woman Who Walked into the Sea is, if anything, *better*. In my opinion anyway. You'll certainly enjoy the setting for that one. I read what you said about The Woman Who Walked into the Sea, and if it weren't for these ARCs with deadlines, I'd be reading it right now! Isn't this a great book, Cathy!? So complex, and yet one doesn't feel drowned in that complexity. And I really did like the characters. I admired the way the various plot threads were drawn together, too. Yes-- an all-round excellent book. I could talk about it for days! I know precisely what you mean! I agree exactly with this review. I read this book in 2013 and thought it was one of my best reads for the year. That is for many reasons. One is that the author juggled three plots well. But what got to me was the sense of place on a Scottish island. It got me thinking about what it must have been like for its residents before central heating, electricity, bathrooms and sturdy windows. Also, the isolation must have been awful. I could not put this book down and went into what some refer to as a "post-good-book slump after I turned the last page. Couldn't find another good book for awhile. I would give it an A-plus, too. I do have the second book and must read it. But who are your two best trusted book sources? Inquiring minds want to know. I've learned that when Cath gives a rave review on her blog Read Warbler, that I almost always love the book, too. The other trusted advisor is a friend who doesn't have an online presence (and refuses to have one even though I keep gently twisting his arm). Well, I guess we readers get the benefit of these recommendations as we read the reviews here and see which are the raves. That's a good way of looking at it! Aha, a little detective work. There is a third book in this series, "The Malice of Waves." Amazon US has it posted. Yes, I've been keeping my eye on it. Oh my! How am I going to be able to wait. I love good crime mysteries. Lately, however, I've been resorting to movies/TV which is no comparison to a good book. But I know me and if I get engrossed in a good book, the knitting goes on the shelf. So I will have to wait. Thank you all so much for your reviews. I love anything coming from England and Scotland. More depth than a lot of other stuff I've seen. Thanks again.